Naihanchi shodan is the first part of a three part series of katas. It is practised by many karate styles in slightly different forms. Some styles have modified it more than others, some have hung lots of add on bunkai to their versions and some have modified the movements to the point where common bunkai won't quite fit any more. The explanations found here should fit for most of the versions of Naihanchi. If yours doesn't fit, please check how the earliest practitioners of your style performed the kata, it may have been modified. The descriptions below are unlikely to match your version of the kata exactly. They are just there as a general description. Bring your feet together into heisoku-dachi. Bring both your hands in front of you a hand span in front of your body. Place your left hand on top of your right. Turn your head 90° to the right. Bend knees and step across your right leg into kosa-dachi. This is a transitional movement only. Step out with your right leg into kiba-dachi / naihanchi-dachi / Heikō dachi. Some styles lift the moving foot to above knee height as part of this movement. Close your left hand into a fist and pull to your left hip. Sweep your right arm up in an arc from in front of you to out horizontal to the right. Note the hand doesn't travel in a straight line. Some styles rotate the hand until it is palm upwards. Turn the whole upper torso to the right and strike mawashi-empi with the left elbow into the right hand. Turn your head 180° to the left. Bring your left and right arms across your body to the right hip, into kosa-kamae, right fist facing palm up and left on top, held vertically with the palm of the fist facing towards the body. Block to the left gedan-barai with the left arm. Pull the left hand to your hip with hikite, palm up. Simultaneously punch with the right hand using kagi-tsuki. Note that while the final position looks somewhat like kosa-kamae, the punch should stop at the centre of your body just below your sternum, approximately a handspan from your body. Step across with your right foot in front of your left into kosa-dachi. Step out with the left leg into kiba-dachi / naihanchi-dachi / Heikō dachi. Simultaneously rotate the right arm from horizontal to vertical; block to the front with the right hand and turn your head to the front. Bring your right arm across to the left and simultaneously your left across to the right underneath your right arm. 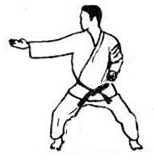 Bring your left arm up to the rear on the outside of the right, blocking jodan to the rear. Bring your right arm down inside the left to block gedan to the front with the right arm. Punch with your left arm to jodan level with Ura-tsuki. Simultaneously lift your right arm until your fist is beneath your left elbow. Turn your head to the left. Execute a returning wave (nami-gaeshi) kick with your left leg. Note this should come up in front of your right leg and not touch the inside of your left. Step back down into naihanchi-dachi / kiba-dachi / heikō-dachi. Simultaneously rotate your *entire upper body 90° to the left*, blocking to the left with your raised left arm. Note your lower body should not rotate. Turn your head 180° to the right. Execute a returning wave (nami-gaeshi) kick with your right leg. Note this should come up in front of your left leg and not touch the inside of your right. Simultaneously rotate your *entire upper body 90° to the right*, blocking to the left with your raised left arm. Turn your head 180° to the right and bring both left and right hands to the right hip in kosa-kamae, with the left hand on top of the right. The right fist should be palm facing upwards, the left fist on top held vertically, palm facing the body. Punch with both left and right arms simultaneously directly out to the left with morote-tsuki. The left arm should be held horizontally at shoulder level. The right should be across the chest just below the sternum. Close your right hand into a fist and pull to your right hip. Sweep your left arm up in an arc from in front of you to out horizontal to the left. Note the hand doesn't travel in a straight line. Turn the whole upper torso to the left and strike mawashi-empi with the right elbow into the left hand. This page was last edited on 21 December 2016, at 03:10.